Here at Family Chiropractic, you become a part of our family. 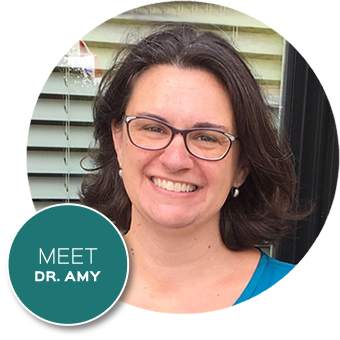 Kennesaw Chiropractor Dr. Amy Reich will treat you with the same love (or tough love in some cases) that she would treat her own parents, spouse and children. We celebrate your successes and we provide comfort in times of defeat or grief. We address all aspects of health—emotional and mental as well as physical. Healing has to happen in all three areas for true health and wellness to be achieved. I am a Chiropractor Because . . . I am passionate about health and wellness. I know that those things cannot be achieved through surgery or the use of drugs. I am in awe of the human body. I believe we were created perfectly. God does not make mistakes. I want to find the cause not just chase or cover up symptoms. I want to empower people to take control of and to be responsible for their own health and happiness. I believe in divine healing and divine inspiration. The Power that made the body heals the body. It happens no other way. We aim to educate our patients about chiropractic and other natural solutions to common health problems in order to motivate you to take a more active and responsibility in restoring and maintaining your own health as well as the people around you. Finding a chiropractor who understands changing health care needs and the most current techniques and approaches to addressing health problems can be a daunting task. Trust us with your health needs! Contact chiropractor Kennesaw Dr. Amy Reich for an appointment today! Highly recommend the care give by Dr. Amy! She’s knowledgeable and compassionate!